Building a successful online store requires designing it around your specific niche. If you want to run a wine or beer store, for instance, you need to optimize your WooCommerce site to showcase your drinks perfectly. This means finding the right tool to sell wine online with WordPress and WooCommerce. Fortunately, the WooCommerce Product Table plugin offers the perfect solution. It adds the layouts you need to sell wine and other alcoholic drinks from a user-friendly one-page order form. In this post, we’ll talk about why WooCommerce Product Table is a smart way to create your wine store. Then we’ll walk you through the process of setting up your shop and start selling wine online in minutes. This simple method works equally well for selling wine, beer or any other type of food or drink. Let’s jump in! WooCommerce Product Table is an ideal way to sell wine, beer or spirits online. Building a successful online wine store requires designing it around your niche. the unique requirements of your niche. For example, you’ll be selling a lot of drinks that are quite similar, distinguished only by attributes such as brand, year, or region. This means you need to find a way to organize all your wines clearly, and make it easy for customers to choose their favorites and order. 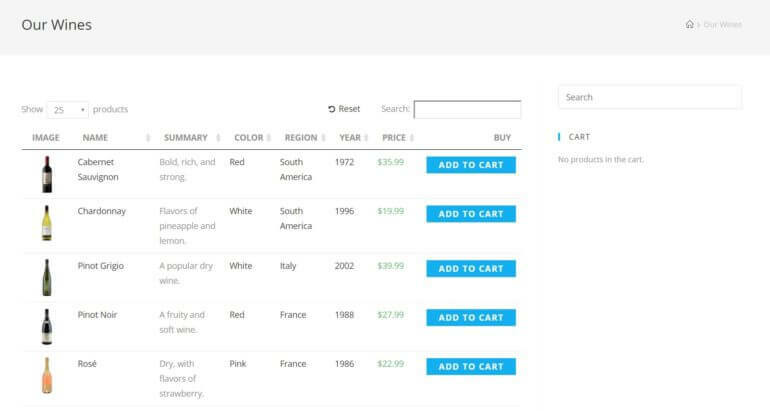 Include search, sort, and filter functionality, which means customers can use the product table to quickly find the wine they want. Display product attributes right in the table, so people can see important information about your wines at a glance. Add images, helping each variety or brand of wine stand out. Wines sell best with small thumbnail images, and WooCommerce Product Table offers the perfect layout for this. Enable customers to make their choices quickly, and check out right away using convenient add-to-cart buttons. Encourage customers to buy multiple bottles of wine through bulk discounts and multi-select checkboxes. And to make your list of wines even more effective, you can add WooCommerce quick view and show extra information in a product lightbox. See the WooCommerce Product Table plugin in action! The easy way to sell wine, beer or spirits online. At this point, you’re probably wondering how much work it is to start selling wines online with WooCommerce and WooCommerce Product Table. Fortunately, it’s easy to set up and you won’t need to hire a developer. Let’s walk through the process of setting it up and using it to sell wine online. Set up a WordPress website for your wine shop. 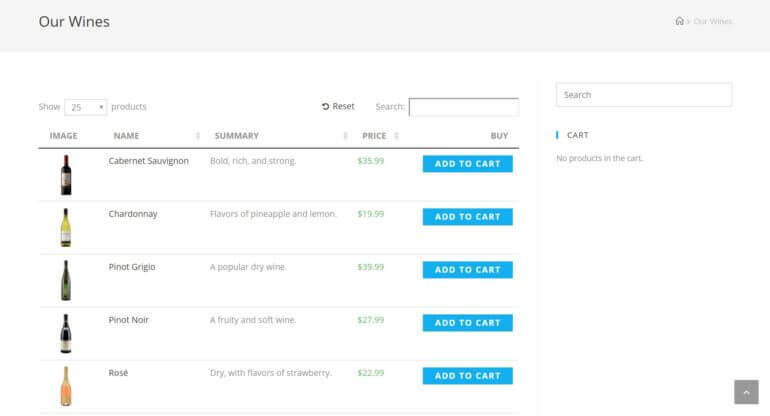 Install the WooCommerce plugin, and add each wine as individual products. At this point, your wines will appear in the default WooCommerce layout which is not suitable for selling wine online. The next step is to transform your store into a customer-friendly wine shop! Keep reading and I’ll tell you exactly how to do this. In a moment, you’ll start creating your product table. First, however, you’ll want to add a few age confirmation features to your site. Since you’ll be dealing with alcohol, you need to make sure you aren’t unintentionally selling to minors. Keep your store public, and add an age verification popup. If you’d rather not hide your store from public view, then you can add a WordPress age validation popup plugin such as Age Gate. This will ask customers to confirm their age before they enter the store. Now that your WooCommerce wine shop is properly protected, let’s talk about how to display your wine products. 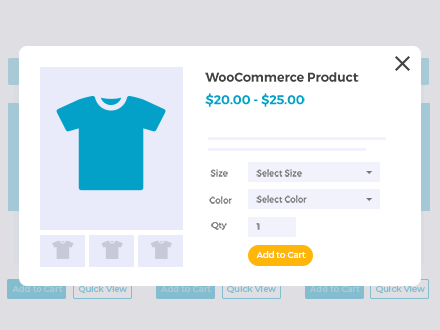 The first thing you’ll need to do is purchase the WooCommerce Product Table plugin, and then install and activate it. Buy WooCommerce Product Table Now! Don’t leave this page just yet. It’s time to start setting up your product table and choose how it will list your wines and beers. Simply list out all the columns you want to appear in your table, separated by commas as in the above example. Here’s a full list of columns that can be included in the plugin’s documentation. To sell wine online with WooCommerce, we’d suggest including (at the least) the product name, as well as a featured image, description, price, and add-to-cart option. You may also want to include a categories column to help organize your wines. Or if your page doesn’t have a sidebar, then the table of wines will fill the width of the page. This is a great start, and now you’ll probably want to personalize the table further. So save this page as a draft, and return to the Product tables settings in the WooCommerce tab. There are a ton of options and features you can add to your product table, and we encourage you to read up on all the choices available. Right now, let’s focus on the settings most crucial to your up-and-coming WooCommerce wine store. Filter dropdown menus that will appear above the table and enable customers to refine the list by product category, tag, attribute, and so on. Filter widget which appear in the sidebar of the page where you’re listing wines in a product table. These are added via the ‘Widgets’ page in the ‘Appearance’ section of the WordPress Dashboard. And for even more advanced filters, you can use WooCommerce Product Table with a compatible AJAX filter plugin. You can also select the Custom option to determine exactly which columns can be filtered and which can’t. Encourage customers to buy more by choosing the ‘checkbox’ add to cart button style. They can quickly tick multiple wines and add them all to their cart together. Add a sidebar to your page and add the WooCommerce Cart widget. 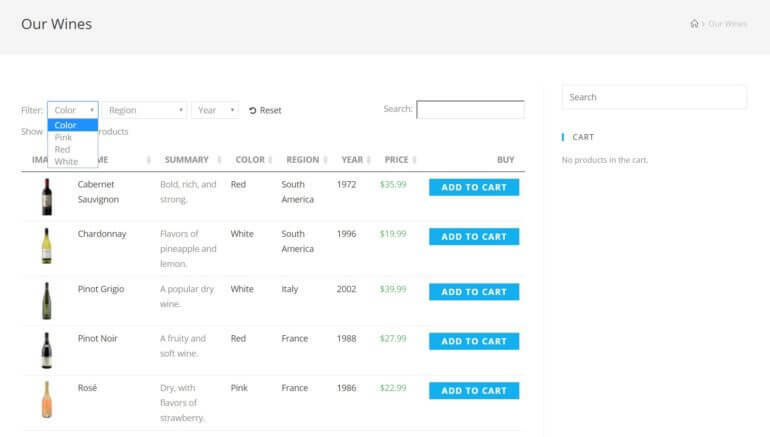 Customers can see the contents of their cart and edit it alongside the list of wines. Speed up your product tables by enabling the lazy load and caching options. There’s one more feature you may want to add to your wine store – subscriptions. Many customers will enjoy getting the same wine bottles or boxes delivered at regular intervals. This is a smart way to get recurring revenue from your store, keep customers loyal, and increase your average customer lifetime value. With this tool, you can create whatever subscriptions you like, and enable customers to set up recurring payments. Then, it will simply inform you whenever a new order needs to be shipped. It’s a fantastic way to increase the revenue from your WooCommerce wine store. When you’re selling wine in WooCommerce, it’s best to keep customers on the list of wines. People tend to buy multiple wines at once, so you don’t want to take them to a separate page for each wine. After all, they might not find their way back to the wine list! If you want to show more information about each wine than will neatly fit in a product table, then quick view is the answer. The WooCommerce Quick View Pro plugin is designed to work on its own or with WooCommerce Product Table. It adds quick view links or buttons to the table. Show extra information without taking customers to a separate page. Choose what information to show in the quick view lightbox. For example, this might be multiple product images (e.g. a glass of wine, the bottle, and a wine crate), the short description, reviews, and add to cart buttons. Select variations and quantities directly from the lightbox. By default, WooCommerce has a set price for each product. 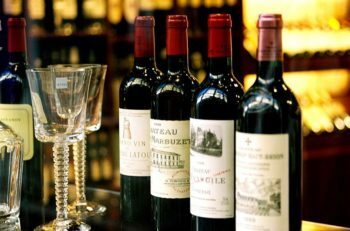 Given the high delivery costs associated with selling wine online, customers like to stock up on wine and buy a few months’ worth in a single order. Volume discounts are a great way to encourage them to buy more wine from you. Product variations – Add each wine as a variable product. Create a variation for each quantity. For example, offer one variation for a single bottle and additional variations for a box of 4 or 6 bottles. The price per bottle will be lower for the higher quantities. Bulk discount plugin – Alternatively, use the Dynamic Pricing plugin to automatically calculate volume discounts based on the quantity in the customer’s cart. If you want to sell wine online, you’ll need to design your e-commerce wine store thoughtfully. What’s more, you’ll want to find a way to show off your wines in the best light, and make ordering as simple as possible. The WooCommerce Product Table plugin enables you to do both of these things, and much more. Set up a basic product table. Add key features to your wine shop product table. Enable customers to purchase subscriptions. Do you have any questions about how to sell wine online using WooCommerce Product Table? Let us know in the comments section below!